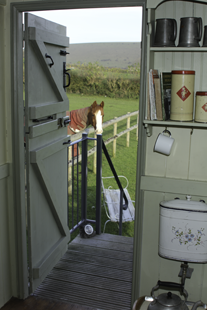 So last weekend Mr T booked possibly one of the coolest places to stay: A beautifully restored tiny shepherds cabin set into a field of buttercups and daisies with gorgeous sweeping views of Fontmell Down in Dorset. Outside hens, horses and donkeys roam happily. Inside, a small but perfectly formed quilted double bed, a few books, binoculars, scrabble and lots of candles. This isnt about the mod cons: There is no television instead a Roberts Radio for company, in the evening the only light comes from candlelit lanterns (super pretty and tres romantique). Heat is from Pipsqueak, a miniature wood burning stove which packs a surprising punch. There’s a kettle to make tea (using pipsqueak of course) and on Saturday night – having tried the v good Fontmell pub the night before – we decided to make our own supper using a basic wood burner. On the menu: local sausages, asparagus from a nearby farm, garlic bread, local crumbly Cheddar and plenty o’ wine. 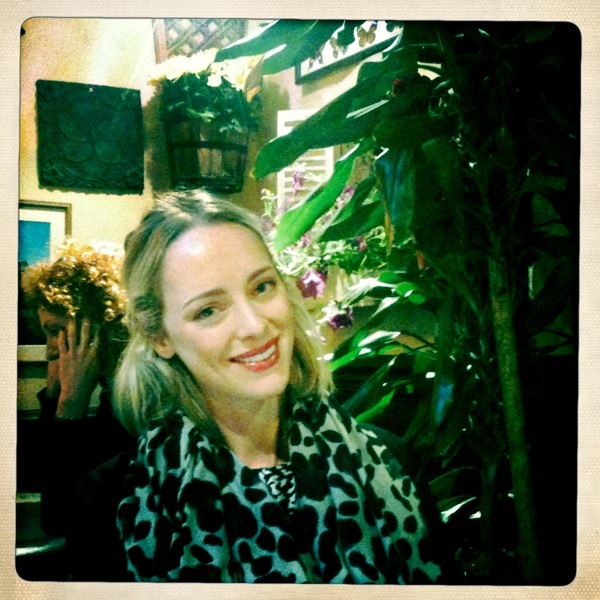 One of the BEST suppers I’ve had a long time (probably because we had to work so hard for it). 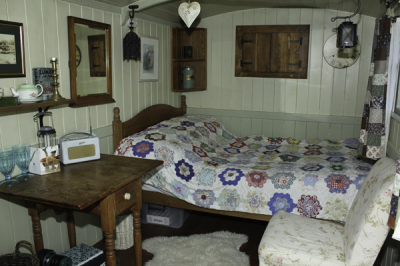 There is also Rosie the 1934 year old Gypsy caravan also restored by Tim and Lucy and available to book. Once a showman’s wagon built for itinerant fairground workers and performers, it’s since been beautifully resoted and painted in the Romany style (and unlike the Shepherd’s Hut has this new fangled thing called electricity but you don’t want any of that). This entry was posted in Kitchens, Pubs, Uncategorized, Vintage and tagged Quirky places to stay, Travel, weekend escapes. Bookmark the permalink.